I just got home from DevRelCon Tokyo, which was my first DevRel conference ever. It was a really valuable experience for me to hear other DevRel folk share their experiences and knowledge about the many aspects to Developer Relations, from documentation to community building to client SDKs and more. 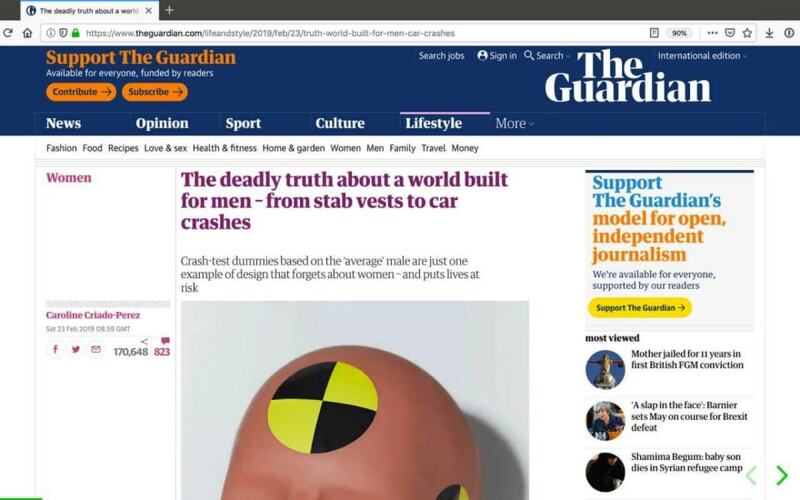 This morning I read an article, The deadly truth about a world built for men – from stab vests to car crashes. And it opened with an anecdote about broadcaster Sandi Toksvig’s experience while studying anthropology in University. The article goes on to talk about how the world was designed from a man’s perspective, examples from healthcare, the design of tools and protective equipment, the gadgets we use, voice recognition software and so on. There are physiological differences between men and women, and many of the things we use in our daily lives are just a little to big for women, just a little too heavy, just a little too male. In our industry, the tech industry, the predominant perspective is unfortunately, young, white and male. There are many historical factors that have contributed to this situation we have now, and it’s a situation that needs course correction. My name is Chen Hui Jing and I’m from Malaysia. 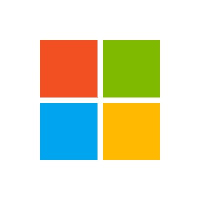 I’m a developer advocate with Nexmo and am currently based out of Singapore. For me, I grew up speaking Hokkien, English and Chinese. 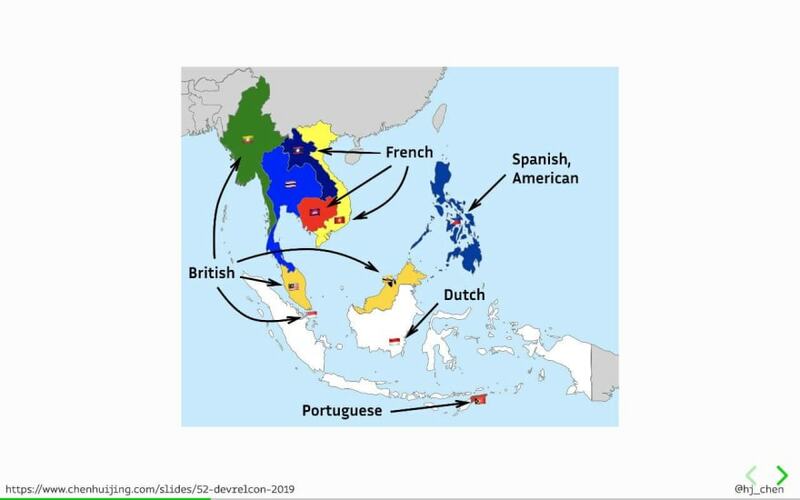 Southeast Asia is made up of 11 countries and 10 of them had been colonised by European powers in the past. When I was a kid, I always got the feeling that our society viewed Westerners as “better”. We watched television shows and movies produced in Hollywood, listened to English pop music, played American-made video games. And as I was growing up, I wondered why we knew so much about these Western powers, but they didn’t know anything about us. Why are we so surprised and impressed when a Westerner speaks our language, but we don’t have the same admiration for locals who speak English? Please note that I have nothing against English, I recognise the benefit of having a so-called global language that facilitates communication amongst all the world’s people. But when only a small number perspectives dominate over others, we lose something as well. For example, print technology. When we talk about printing, many people immediately think about Gutenberg and the printing press. It is less known outside of East Asia, that the first moveable type emerged from China. It was invented by an ordinary citizen, Bi Sheng, during the Qingli reign from 1041-1048. Korea adopted Bi Sheng’s idea of moveable-type printing during the Kingdom of Goryeo and brought it to new heights during the Kingdom of Joseon. All this happened way before Gutenberg. The stories being told matter. Who tells these stories matter as well. Moveable type worked very well for alphabetic languages, with a limited set of alphabets that could be combined to form words, sentences and paragraphs. But there are plenty of scripts like Arabic and Devanagari, where the letterforms are different depending on its position in the word. Or scripts that utilise Han characters, like Chinese, Japanese and Korean, which consist of tens of thousands of different glyphs. We managed to develop some form of letter-press printing, but in doing so, we compromised the beauty of our native scripts. Ali Spivak mentioned this morning that diversity is about variety, the inclusion of different types of people in a group or organisation. Diversity of thought, perspective, culture. 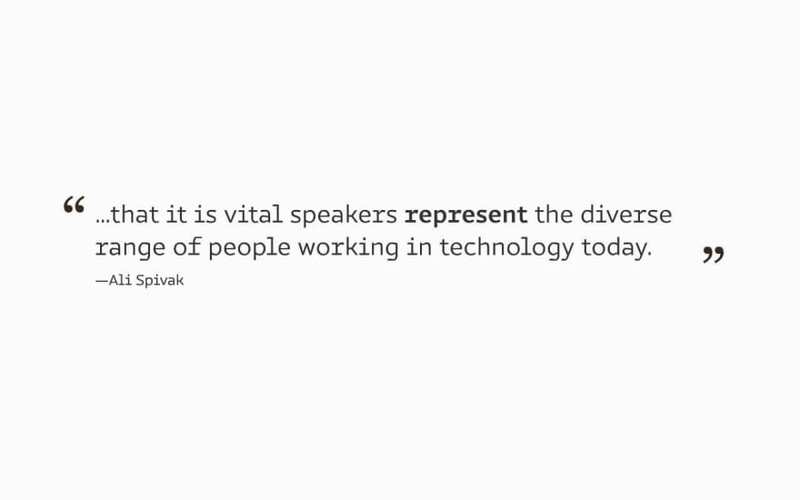 The importance of regional representation, that it is vital speakers represent the diverse range of people working in technology today. Voice recognition software has become more prevalent in recent years, we have Siri, Alexa, Cortana and so on. But Rachael Tatman, a linguist researcher and National Science Foundation Graduate Research Fellow at the University of Washington, found that automatic transcriptions on Youtube were almost 70% more accurate for male speakers than female. And when the auto industry started implementing voice commands in vehicles, women had a tougher time utilising this technology than men. Training of such software requires large datasets, and developers who build them either record their own voices or voices of other linguistic researches, but sometimes these datasets don’t include diverse speakers. 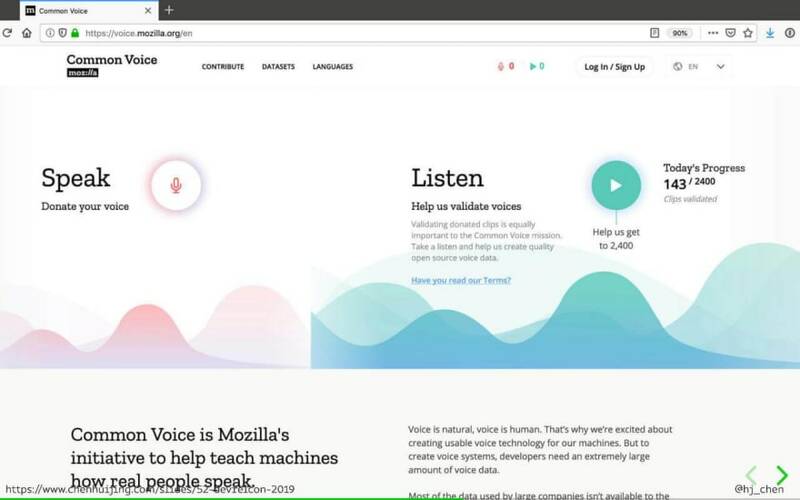 Mozilla has a Common Voice initiative to help combat this issue. But this is just one example among many in the tech industry where products inadvertently end up working well only for a small set of people, while the rest have a compromised experience. The world is full of diverse cultures and because our cultures are different, we value different things. We cannot wait for organisations and companies, like Mozilla, to cater their products to us, because most of them don’t. Often it is not because they want to ignore us, but because they are not consciously aware of us. We, and I say we as an Asian person who grew up in an Eastern culture, generally don’t really speak up. Public speaking is challenging for everyone, regardless of where they come from, but I think it’s especially hard for people from Eastern cultures. Often times, I get the feeling of, what I’m doing isn’t that great, or who am I to stand in front of other people, like yourselves, and talk about what I do? But then you have this small group of young, white men in tech who demand that their voices be heard, they write all kinds of blog posts and articles, speak publicly and loudly about the work they are doing, how awesome they are and so on. And this builds a false impression that this is what the world is like. It is high time that we start sharing our perspectives, all our different perspectives. Because even though it is not something that most of us are naturally conditioned to do, there is value in contributing our perspectives to the world. Are there any web developers in the audience today? 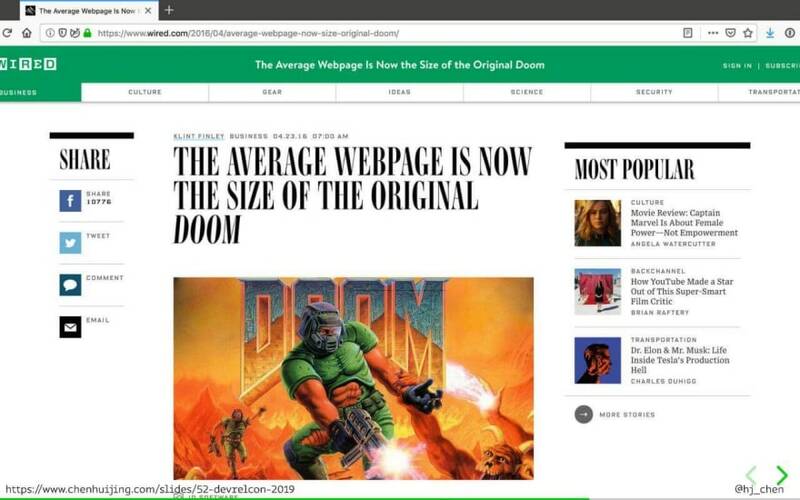 Back in 2016, there was a WIRED article titled The Average Webpage Is Now the Size of the Original Doom, which was 2.39mb. Now, internet infrastructure varies widely across the world, but in many developing countries, data infrastructure is lacking and expensive. Even something as benign as forgetting to optimise your website’s images, can add up to a significant portion of an user’s income in Niger or Madagascar, for example. That’s why it is important for developers from those regions, and every region around the world for that matter, to make their voices heard, and bring a greater awareness of the situations and contexts that we operate in. Jarod mentioned just now how important is was to for conferences to have minimum standards for diversity and inclusion, and that’s a step in the right direction in terms of conference organisation. But there’s also much work to be done from the side of speakers, and content creators in general. This is not something that will change overnight, but we have to start somewhere. Start by contributing to open-source projects, and pointing out if a particular feature or design decision is missing something. Start by writing about your work, your opinions and your stories, to show the rest of the world a different way of working and thinking. And, even if it feels scary, to start speaking about what you’re working on, or things you’re interested in, because it matters to have people on stage who look like us, to inspire anyone who looks like you or identifies with you that they too have something valuable to say. DevRelCon Tokyo had a lightning track this year and they took submissions all the way till lunch time on the day of the conference. Before I got to the venue that morning, I read an article on Guardian about how the world is built for men, which sometimes lead to deadly consequences for women. Somehow this was the article that triggered me to submit a lightning talk on the value of sharing our perspectives. “Our” in this context was those of us who grew up in an Eastern culture, but I think it can apply to anyone who isn’t in a position of privilege. The talk did not exist when I wrote the topic on the Lightning Talk Submissions board that morning. But I think the ideas had taken shape in my brain over a long time. 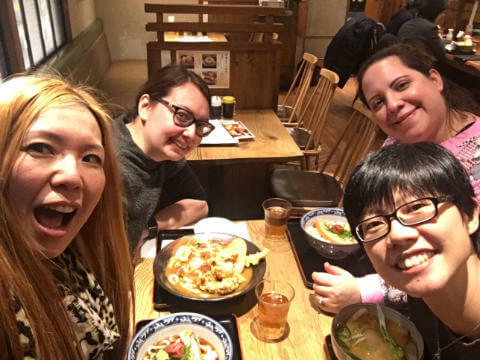 Just the night before, I was chatting with Tomomi Imura (NexmoDev alumni and one of my favourite people to hang out with) and she mentioned how difficult it was to get Japanese to do public speaking. 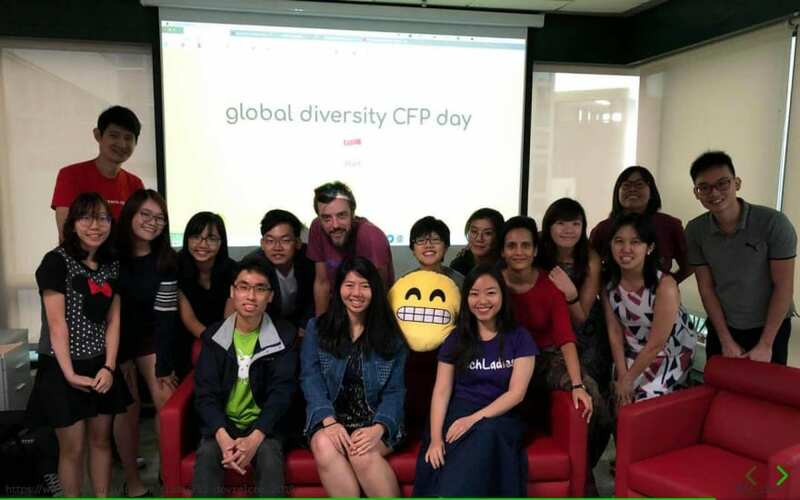 I was also fresh off the experience of organising the Singapore chapter of global diversity CFP day, so maybe that was a factor as well. Regardless, this talk was an organisation of the many thoughts and opinions I’ve had in my head for a while. That being said, I don’t recommend pulling together a talk on the day itself, even if it is a lightning talk (maybe especially if it is a lightning talk, because of stricter time constraints). Thankfully, I received positive feedback about it and I think it was recorded, so I’ll share that when it gets published as well. Meanwhile, have some slides.